Burger lovers’ prayers are answered at the Stone Church! Matt Stone, from WFMJ, helps us review Stone Church Pizza House and Brew Pub. Click here or on one of the pics to read. Donna’s Diner knocks it out of the park in our 1st review of the year! Click the pic to check out the story! We crossed the line! The state line, that is! 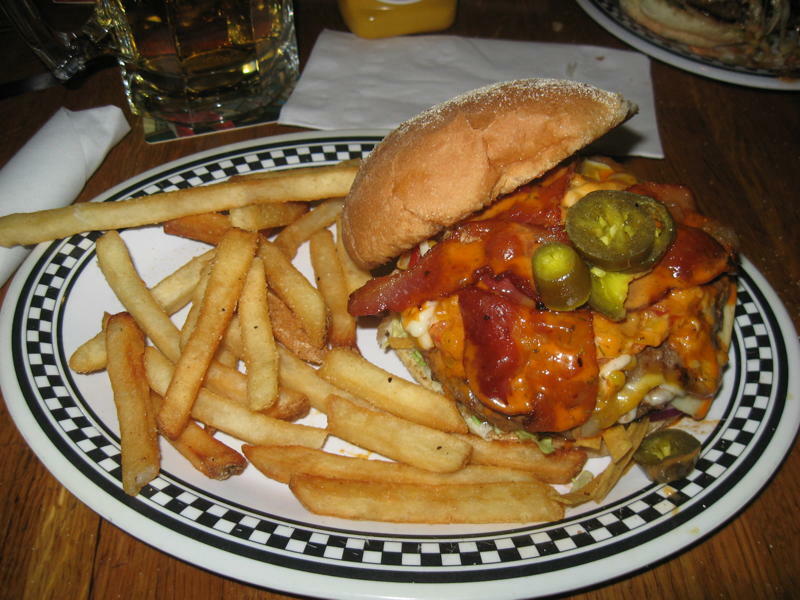 We rated the burgers at a well established Mercer County Inn. 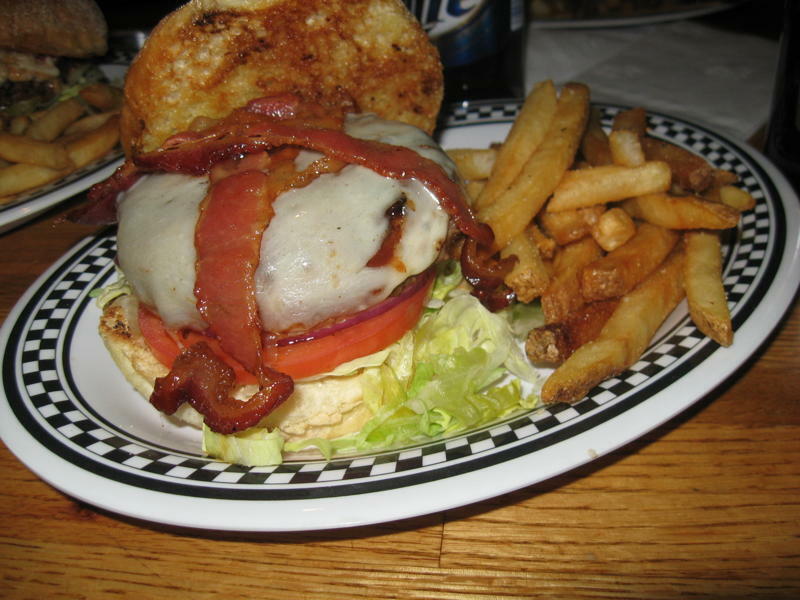 Get the lowdown on the Iron Bridge’s burgers by clicking the below pic. You never know where you’re going to find a good burger. We followed a lead that took us to Muscarella’s Cafe Italia, in Sharpsville, PA. Click the pic and get the lowdown on their burgers! It’s 2011 and time for a new batch of burgers to vie for the Mahoning Valley Burger Review Board’s (MVBRB) coveted Burger of the Year award. First on our list this year, and thanks to the multitude of fans who suggested we try them, is Quaker Steak & Lube in Sharon, Pa. Readers may recall we reviewed the Austintown Quaker Steak & Lube last year. After our review, the patrons of the original “Lube,” in Sharon, said we “have to try the best burger – by far.” So, on our way we went. Originally opened in 1974 as a cook your own steak restaurant and bar featuring steaks, burgers and salads, the Lube became nationally known for their many award-winning wing flavors. We came to the motor sports laden restaurant for the burgers and enjoyed every minute of our meal. Our waitress, Megan McKelvey, took our order and made sure we had an excellent dining experience. Our group of six tried as many of the 1/2 pound burgers as we could: from the Lube Burger (mushrooms, fresh-cooked bacon, hot sauce and American cheese), a Premium Garlic Cheeseburger (a steak burger basted in garlic sauce with sweet roasted peppers and provolone cheese), a Mustang Burger (hickory smoked BBQ, provolone, bacon), an All American Cheeseburger (with your choice of Swiss or American cheese), and an Arizona El Camino Burger (pepper jack and cheddar jack cheeses, bacon, sour cream, jalapenos, tortillas and a corn salsa). The burgers are served on a garlic toasted bun, topped with lettuce, tomato, onion and pickles; served with your choice of fries, chips, baked beans, coleslaw or broccoli for a side. We liked how the garlic bun enhanced the flavors of our respective burgers as well as not fall apart with the very juicy beef, and we enjoyed a nice complement of crispy fries which filled out our checkerboard plate. You can’t go wrong choosing any of the burgers and you can find a burger for everyone’s taste. After you place your order, take a walk around and enjoy the floor to ceiling automotive memorabilia. There are different cars and motorcycles throughout the building. 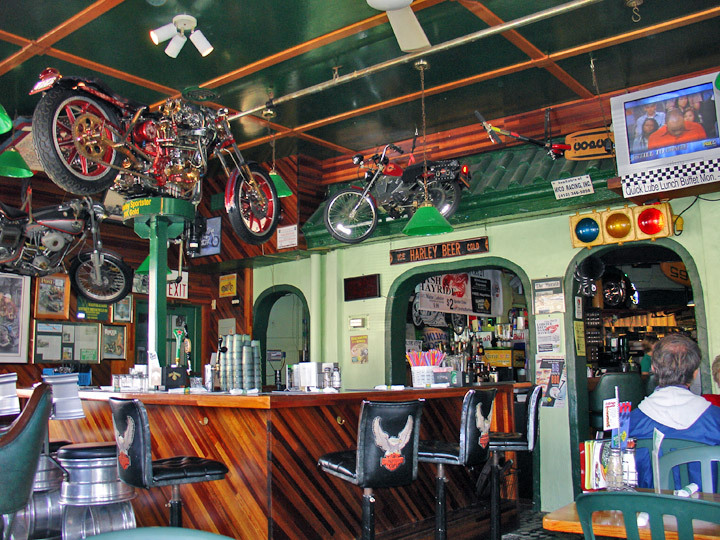 Especially check out the oldest piece: a 1936 Chevy truck on the ceiling by the bar. 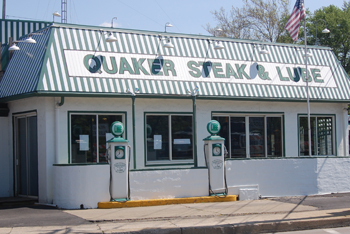 They always say “don’t mess with an original,” and the Sharon Quaker Steak & Lube proved that to be true by besting the Austintown Lube’s burgers. Maybe it was being in the original Quaker Steak & Lube, or having the original grills make our burgers, but the Sharon location had that little extra. 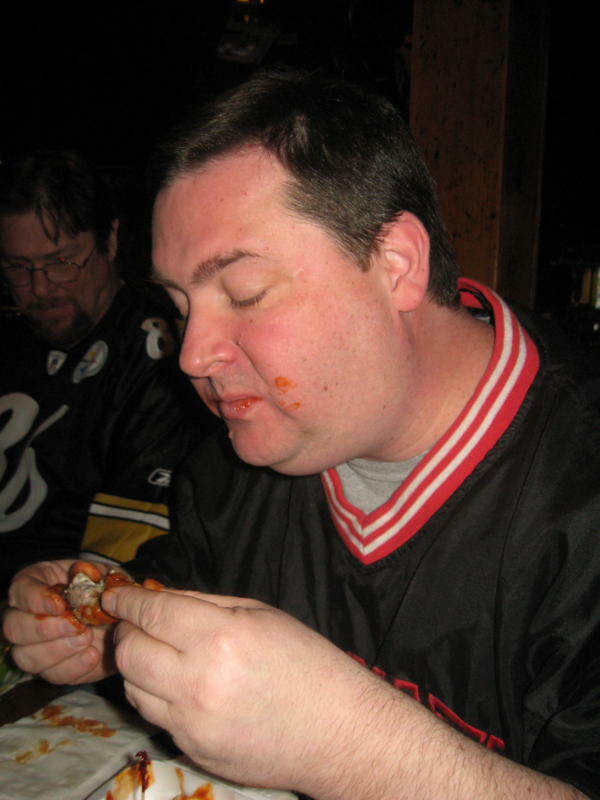 Greg had no problem with the Lube’s “Atomic Wing” challenge! After our meal, newest board member Greg was still hungry, so we coaxed him into trying the wing challenge — 3 Atomic wings and 3 Triple Atomic wings. He gobbled them down before we could ask him if they were hot, and barely broke a sweat; unlike Man vs. Food’s Adam Richman who was sweating after a couple bites when he tried the challenge on his show. We would like to thank everyone who keeps sending suggestions and telling us where their favorite burger place is. Keep sending them to mvbrb@hotmail.com, or leave a comment on the Hamburger Review Board’s Facebook page.